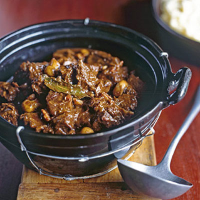 There is nothing to beat a big, steaming casserole of meaty beef and mushroom stew on a chilly evening. When it's good, it is wonderful and repays the hours of slow simmering. Serve with buttery mash – lots of it – and carrots. Preheat the oven to 150°C, gas mark 2. Toss the cubes of beef in the flour. Heat half the oil in a large frying pan over a moderate heat. Add one third of the beef and brown on all sides. Take the first batch out, and place in a casserole. Repeat with half the remaining beef, and then the last lot, adding more oil when necessary. Fry the bacon and onions gently in the pan, until the onions are tender and translucent. Tip them over the meat in the casserole. Tuck in the bouquet garni and season the contents with salt and pepper. Return the frying pan to the heat and add the beer. Bring up to the boil, scraping up the tasty brown residues stuck to the base of the frying pan. Stir in the tomato purée and sugar, then pour the mixture over the contents of the casserole. Add enough boiling water to cover the meat. Stir, cover and transfer to the oven. Leave the casserole to cook for 2–3 hours, stirring occasionally, until the meat is very tender. Fry the mushrooms in butter until lightly browned and tender. Stir into the casserole once the beef is done, then return to the oven, without the lid, for a further 15 minutes. Discard the bouqet garni before serving. Serve immediately, or if you’ve prepared the stew for serving later on, reheat the cooled stew thoroughly on the hob, allowing it to bubble for a good 4–5 minutes (adding a little extra water if necessary) before serving. Drinking anything other than beer would seem odd with this combination of flavours. Try any rich wintry ale, although you might be happiest with a creamy pint of stout.